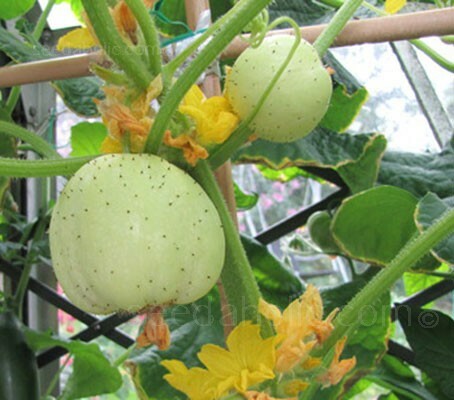 Lemon Cucumbers are a very old variety cultivated since in 1894. They were first introduced from New Zealand and appeared in Ferry Morse's 1934 seed catalogue. 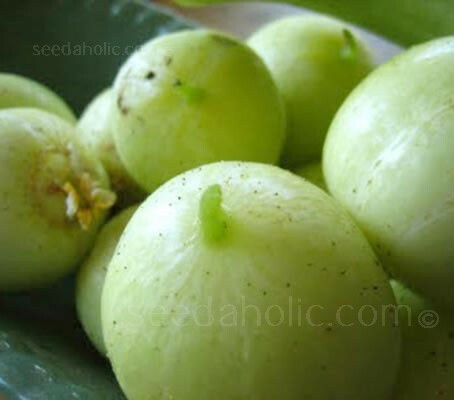 Marketed as Crystal Lemon or Crystal Apple, each fruit is the size of a small apple, hence it was known as 'Apple Cucumber', but as its fruit is a pale yellow in colour when ready to eat it is often called 'Crystal Lemon'. These names refers simply to their appearance, not their flavour or aroma. These cucumbers do not smell or taste at all like apples or lemons. They are very similar to a typical cucumber, with tender pale greenish skin and sweet flesh, they have the best flavour while young at about 5cm (2in). The skins toughen with age so pick them when they are small. Lemon cucumbers are grown just like regular cucumbers. They are a vigorous climbing variety that can be grown indoors in a greenhouse or polytunnel or outdoors in humus rich, moist soil and sunshine. They can also be grown in containers and given trellises to scramble over. Sown from late April to June for harvesting in July to October, they can be sown indoors from late April and transplanted in May after the threat of the last frosts, or sown in May and June directly outdoors. A favourite with children, Lemon cucumber is perfect for popping into lunchboxes for a healthy snack. By late summer this vigorous climber is smothered in small, round fruits like yellow tennis balls for months. It's an easy-going plant, as happy outside as under cover, and as well as being very pretty. From January to April, they can be started off in 7.5cm (3in) pots, and grown indoors, Place two or three seeds, on their sides, about 25mm (1in) deep per pot, which is filled with moist compost. Sometimes cucumbers transplant badly, handle with care and disturb the roots as little as possible. Cucumbers can be sown in situ from late May when all risk of frost has passed and the soil temperature is at least 16°C (61°F). Prepare holes 30cm (12in) wide and mix in plenty of well rotted compost or manure. Mound the planting hole up slightly as this will help with the plants' drainage. Sow two seeds per mound placing them on their sides, about 2.5cm (1in) deep. Cucumbers are warm season crops, with no tolerance to frost. They must have temperatures of between 18°C to 27°C (64 to 81°F). In cold areas protect the young plant with mulches or cloches. A thick mulch will also help retain water. After they have germinated thin out the seedlings to remove the weakest. Seeds germinate best if kept at 20°C (68°F). Ideal night temperature should be no lower than 16°C (60°F). This temperature should be maintained for four to six weeks after the seedlings have been planted out, so harden off and plant out when all frost has passed. Nip out the growing point when the plants have about five leaves to encourage a stronger growth. Train up the supports tying in as required. When the plant has reached the top of the support, nip out the tip, two leaves beyond the last flower. Side shoots will then develop, producing more flower and fruit. If allowed to trail on the ground nip out the main shoot when it has produced about 1.5m (54in) of growth and remove side shoots after one leaf. The best forms are the all female ones. All female types may produce male flowers if they are grown under stressful conditions. These flowers should be removed. If grown in a greenhouse, keep it damped down to reduce any pests. Water regularly and feed with a high potash liquid feed every two weeks. Keep an eye out for slugs and snails especially when the plants are young. If they become a problem, use a recommended proprietary brand of slug and snail bait. Try to avoid watering from above as this may lead to a fungal problem especially in warm weather. Pick off any badly affected leaves and spray with are commended proprietary brand of fungicide. Flower and therefore fruit development is sometimes a little erratic at the start of the season. Generally the first flush of flowers will be mainly female. Female flowers have a small swelling (embryonic fruit) behind the petals. Most pollination is done by insects, but if fruit is failing to set, them the female flowers can pollinated by hand. To pollinate by hand, take a male flower and remove all its petals, press it against the centre of the female flower. Pollen can also be transferred using a fine paint brush, taking pollen from the male stamen and brushing it lightly over the female stigma. Cut cucumbers regularly from about twelve weeks after planting. The sides of the fruit should be parallel and about 12 to 15cm (6 to 8in) long. 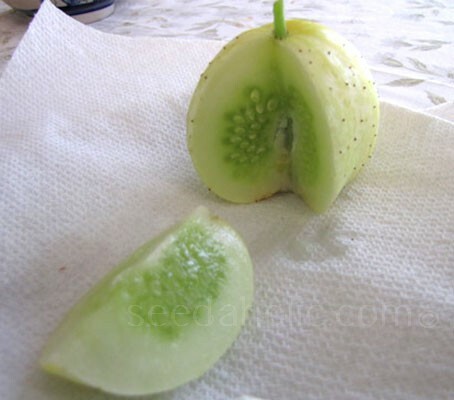 Cut them with a short stem and check the plant regularly for fruit. Regular cutting will produce more fruit. Cucumbers generally don't store for very long unless pickled, so cut and use the fruit while fresh. The fruits are eaten raw, pickled or cooked.